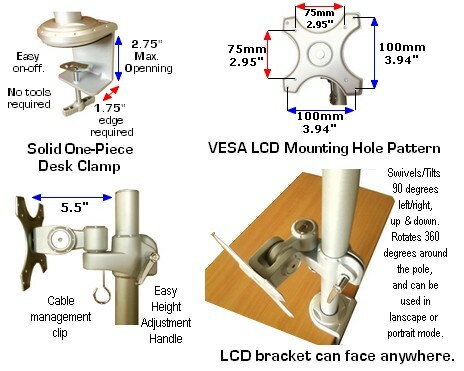 Use this Clamp-on LCD Desk Stand to quickly attach a LCD monitor to a desk or tabletop with its easy-clamp. You will need a table edge with an overhang of at least 1.75", for the clamp to bite the edge effectively. The clamp will accept edges up to 2.75" thick. * LCD can face anywhere: the flat panel can face in any direction 360 around the pole, and can be used in landscape or portrait mode. The height can be set at any point along the whole length of the pole. 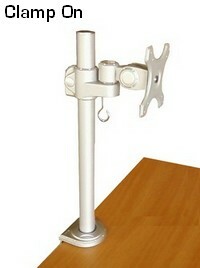 The bracket tilts 90 degrees up & down, and swivels 90 degrees left to right. - Clamp: for up to 2.75" thick tables. Ideal free edge: 1.75". If no protruding edge, the pole can be screwed to the the table top's edge. Ideal for setting up LCD monitors in POS counters (point of sale), call centers, restaurants, schools, classrooms, etc. 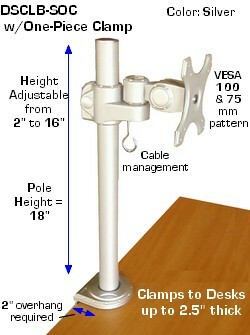 Also great for attaching a LCD screen to a rolling computer desk and safely moving the desk from one spot to another. * Want to mount an iPAD? Simply add our optional new D-IP Ipad Holder bracket, which allows to add an iPAD to any of our LCD mounts or any VESA 100 & 75 mm LCD bracket.